Financially troubled Bolton Wanderers will pay staff their January wages, the Championship side have confirmed. Bolton said on Friday they had obtained a High Court validation order enabling the sale of land near the stadium to an adjacent retail park. Trotters boss Neil Lennon had earlier said coaches were using their own money to help pay administrative staff. About 300 staff based at Bolton's Macron Stadium and their two training grounds had not been paid this month. "I've got staff who are struggling to make ends meet," said 44-year-old former Celtic manager Lennon. "That's not a great scenario, so some of us are having a whip-round for a few of them just to keep them on board." 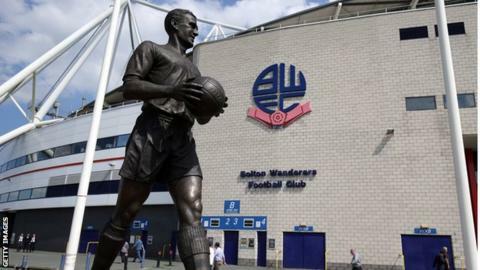 On Monday, Bolton were given until 22 February to resolve issues that led to Revenue and Customs bringing a winding-up petition. The Trotters are £172.9m in debt, owe HMRC £2.2m and did not pay their players on time in November. Financial advisor Trevor Birch is trying to negotiate the sale of the club from owner Eddie Davies. The club added that they would provide an update on the land transaction on Monday.